The IBM BladeCenter PS700 Express is a single-wide blade with a 4-core 64-bit 3.0 GHz processor, and eight DIMM slots which can contain up to a maximum of 64 GB of memory. 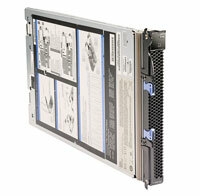 Two optional SAS Small Form Factor (SFF) 2.5-inch drives can be installed in the PS700. The PS700 is designed to make it more affordable to consolidate multiple independent applications on a single blade using the same proven virtualization technologies offered on IBM Power servers. The POWER7 processor- based PS blade automatically optimizes performance and capacity at either a system or virtual machine level and benefits from the new POWER7 processor, which contains innovative technologies that help maximize performance and optimize energy efficiency. Custom Configure your 8406-70YA now or request a quote on upgrades and/or parts, or contact us at info@vibrant.com or 888-443-8606 with any questions. For pricing on new or used IBM 8406-70YA server models, upgrades or parts, please contact Vibrant sales at sales@vibrant.com or call 888-443-8606 or 952-653-1700.